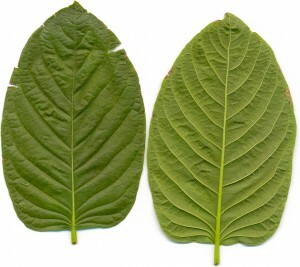 In low dosages of a few grams of leaf, kratom functions primarily as a stimulant, with effects similar to caffeine without the marked jitteriness of drinking several cups of coffee. 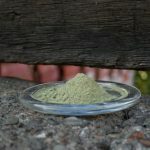 In higher dosages, kratom functions as a neurological opiate, triggering the mu opiate receptors in the brain, even though kratom is chemically different from the opium derived medications such as codeine, morphine, hydrocodone, and oxycodone. 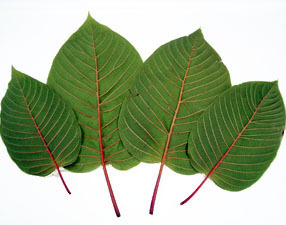 Until 2002, the alkaloid mitragynine was believed to be the primary active ingredient in kratom. Out of all the alkaloids in kratom, there is more mitragynine than any other alkaloid. In the 1970’s, the predecessor of the pharmaceutical giant GSK did research into the medicinal potential of mitragyna speciosa. They did a scientific study comparing the effects of pure mitragynine to crude extract of kratom leaf and found that mitragynine by itself was not an effective analgesic medicine. They subsequently decided that there was no medical use for kratom. In 2002, the true active alkaloid in kratom, 7-hydroxymitragynine, was discovered by a group of Japanese researchers. These researchers have filed a patent for all possible medical derivatives of mitragynine and over the next few decades will likely bring kratom derivatives to market as patented pharmaceutical drugs. Also see Erowid’s kratom scientific literature overview. 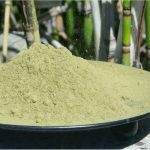 Great website with really good information about Kratom. I like how you have a range of different articles on here from user experiences to the basic science. Keep up the great work. Thank you! I was on hydrocodone for seven years when the opiate scare started and my doctor cut me off so I tried kratom it is great for me there was no withdraw symptoms at all. works great for me I use two rounded teaspoons every five or six hours and I feel better than those opiate drugs they were handing me somebody needs to spread the word this stuff is great I worry about long term effects since there don’t seem to be many studies of it. but so far it works for me and that’s all that matters to me. Kratom has saved my life. I am in chronic pain from a back injury my doctor just gave me pain meds. I became addicted, I quit taking those meds and broke the addiction that had set in. I lived for 5 years in some of the worst pain ever. I was told about Kratom and figured what did I have to loose. After 2 days of the toss and wash method I moved to the gel tablets bought a machine to fill and make my own. I found out the the strain that works for my body is a mix of a green and red strain. They were Plantation Green Mang Da and Red Mang Da. I have my life back. I take 4 capsules of the mix in the morning and then 2 at lunch. I have my energy back and can now say my pain which was around a 7 or 8 on a good day is now a 1 or 2. Kratom has given me life and happiness again. I am in exactly the same boat! I have to say—It is a miracle! I have just began and I am tapering off these horrible medicines myself. So first off make sure your website is very reputable. SacredKratom or Kratomystic etc are both good. Anyway start with the RED Meang Da, 4 full capsules of powder. Empty stomach. Then once you start feeling better after 20 mins you can take another see how you feel. (Like anything proceed with caution! ) but as far as further you’d have to research. I believe the red strains are what we need. I could be wrong. 🙂 hope it helps you too!!!! I suffer from severe anxiety, depression and chronic back pains due to two slipped discs. Pain meds and antidepressants and such, never worked or only worsen my state. I take the Red Strain of Keaton, have been for three years now. And I feel like a whole new me. I can work, function normally and there are no side effects. Best stuff ever. Give it a try. I drink it in coffee. To get the pain-killing effects, but not to be overly sedated, what do you suggest as a starting dosage? And then as a maintenance dosage? really depends on type of kratom , but usually start out with 2 to 3 grams and wait and see the effects on you,wait 1/2 he. to 45 minutes if no results try 1 gram more until you find what best works for you. kratom is a wonderful plant that got me off pain meds with no withdrawals,off meds over a year,God bless kratom. I’ve suffered with pain for the last 16yrs now! I’ve had many Mri’s, & at least a 100 different injections and doctors still don’t know for sure what it is. Now they want to stabilize my sacroiliac joint but insurance won’t cover it. I’m taking 8 Percocets a day plus 2 OxyContins a day. 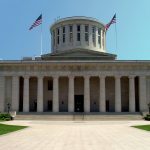 Now the laws are changing and making it harder too get pain medicine. None of these medications are helping me I’m just addicted to them. I have five grandkids now and the pain is effecting what I can and can’t do with them. Im so depressed that I don’t have the energy or ambition to clean my house anymore. My poor husband does it plus works 40+ hrs a week. What would you reccomend for me and the dose and where do you order it from? I’m at my breaking point here and can’t take much more of this pain!! Kratom works.i suffered chronic [email protected] for more than 15 yrs. Drs.only prescribed me pain @ anxiety meds.i bellieve too have worsend my condition.through. a friend i learned about Kratom. I feel better now than i have felt in 18 yrs.educate yourselves on kratom and change your life……. Try the red meng da fine powder.thats about the strongest one for pain and seditive effects.its about twice as expensive as the other strains but it really works man.ill never agsin go back on pain killers…this stuff works and everytime i stop for a week or so,i feel no withdrawls at all….i have my life back and this stuff really helps.im at the gym everyday and now at 40 yrs old w multiple herniated disks,all my lifts are bigger than when i was in my 20’s.give it a shot. I’m interested in using kratom, but cannot afford the sedating effects. I lead a very busy life and this is what has stopped me from successfully ridding myself of other drugs (2 yrs on suboxone , currently 2 – 4 g daily). I want to be rid of this once and for all and have read about the various strains of kratom. The information is overwhelming. You mentioned working out at the gym. What strain do you take and how much per day to start? What do you consider a good *maintenance* dosage? It lasts for awhile….try one to two teaspoons of the red meng da fine powder to start,sharone….u just dump it in ur mouth,take a drink of water or ice tea makes the taste go away,swish it around and swsllow…very simple…good luck to ya. Red Bali strain. It has the highest concentrations of the alkaloids in kratom, highest pain killing properties, and anti anxiety properties. Start out @ 4-6 grams then increase 1 gram as needed .